What spiritual object do you like to have in your house? Which activity makes you feel your most spiritual? True or False: Horoscopes are accurate. Do you believe crystals have healing properties? When you're asleep and dreaming, do you believe your dreams are full of deep symbolism? 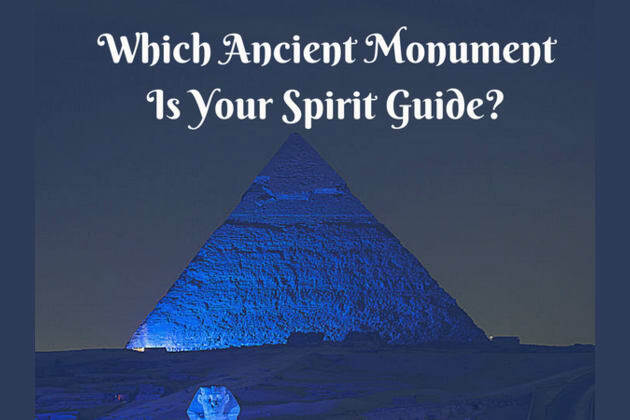 Your ancient monument spirit guide is the Egyptian pyramids! The pyramids of ancient Egypt resonate with you spiritually, for they, as you do, are representative of an advanced culture with a solid belief in the afterlife. Animal companions are important to you, too, as they were with the Egyptians. See you in the afterlife! Your ancient monument spirit guide is Stonehenge! Stonehenge was thought to be used by ancient druids in England. You're in tune with horoscopes and the changing of the seasons, as were the druids. With Stonehenge on your side, you'll be faithfully guided by the stars and the ancient powers that be! Your ancient monument spirit guide is the Parthenon! The Parthenon was dedicated to the ancient Greek goddess Athena, who was a fierce warrior. You're pretty fierce yourself! With the Parthenon on your side, you'll be sure to understand which battles in life to pick. Because that's the truly important part of being fierce! Your ancient monument spirit guide are the Easter Island statues! Historians still have no idea why the Easter Island statues were built, or what purpose they served. But you know instinctively, don't you? The statues call out to you across time and space, and will ensure your path to success and glory. Trust. Let the wisdom of the ancients guide your way forward.